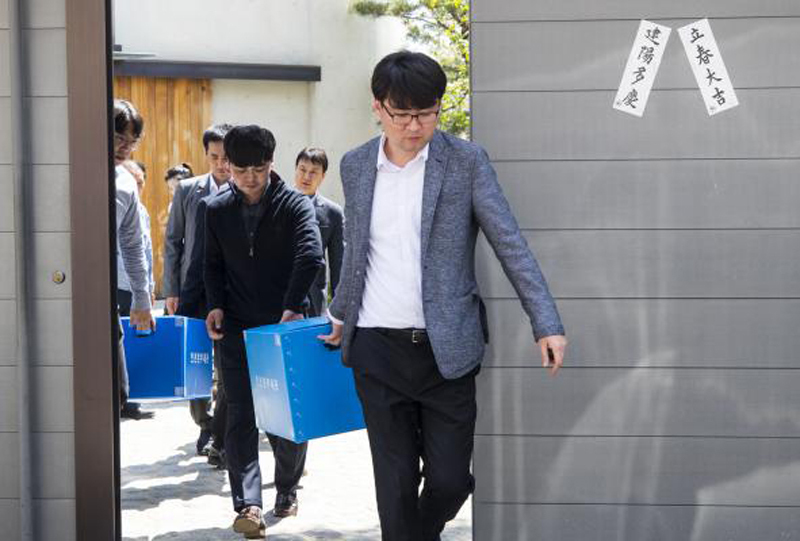 Officials of the Korea Customs Service exit the residence of Cho Hyun-min, senior vice president of Korean Air, in Seoul, South Korea, 21 April 2018, after searching for evidence over allegations that Cho and her family didn't pay duties on luxury goods brought into the country through the company's flights. Photo by Yonhap. Cho Hyun-ah, former executive of Korean Air, who made global headlines with the infamous nut rage scandal, faces a divorce lawsuit from her husband of eight years. According to legal sources on Monday, Cho's husband filed a divorce suit to Seoul Family Court on Apr. 2, and requested custody of their children. Cho reportedly hasn't yet appointed an attorney and the trial date hasn't been set, Yonhap reported. Cho and her husband, the head of a famous cosmetic surgery practice in Gangnam, married in 2010 and had twins, Yonhap reported. In 2014, Cho became widely known for the nut rage incident, when she flew into a temper on a Korean Air flight between New York and Seoul, over macadamia nuts being served in a packet, instead of a proper plate. She forced cabin crew concerned to kneel and apologize, while ordering the plane to return to the gate and forcing the chief flight attendant off the plane. The 44-year-old was sentenced to a year in prison for breaching aviation safety laws, but was released after three months last year after a high court suspended her jail term, JoongAng Ilbo reported. Her younger sister Cho Hyun-min is now on the hot seat, due to her own "water rage" scandal. The younger Cho is expected to face police inspectors Tuesday, over allegations that she verbally abused and threw water at a business associate. The Cho sisters are daughters of Cho Yang-ho who owns logistics giant Hanjin Group which owns Korean Air and Hanjin Shipping. The Cho family is also under tax investigations, as authorities suspect they smuggled luxury items through the bags of their employees and colluded with customs officials to avoid paying duties for the products, upon entering South Korea.